If you're wondering what fiber supplement works best, you should know that this depends on your current health condition. If you're dealing with constipation or other digestive system issues, you should take a fiber supplement based on insoluble fiber. On the other hand, soluble fiber keeps your metabolic health in check. This is why it's important to understand what kind of fiber you need and base your research on this. Either way, you should choose a supplement that is made of natural ingredients and that is safe for everyday consumption. When it comes to weight loss, one of the best fiber supplement is Skinny Piggies. This gummy supplement doesn't only taste great but is made of all-natural ingredients. One of those is Inulin fiber that works the best to promote digestive system health. Which Over the Counter Appetite Suppressant Works? What Fiber Supplement Causes Less Gas? Fed up with boring diet plans? Having zero fun AT ALL? You may not be alone. Frankly, lots of people don't like diet food. It's not fun giving up foods you enjoy, not fun feeling hungry, and most definitely not fun to exercise when you'd rather just lay down the sofa watching a new TV episode of Nurse Jackie. The good news is, now you can help your weight loss with a unique, natural appetite suppressing supplements, Skinny Piggies! These are irresistible fruit flavored supplement gummies that combat cravings for food and your appetite while letting your body to remain in fat-burning mode. Before we discuss what Skinny Piggies gummy fiber supplements are, let's see what's required for fat loss to take place. 3) A diet plan that is satisfying, so that you will sustain it for a long period of time. The fact is that a large number of weight loss plans miss one-- or all three-- of the above points. To see really good success with your diet program, it's critical that you consume fewer calories than you burn off daily. You could do this in one of two ways: increase your caloric output with physical activity or reduce your food intake. Doing both is recommended. If only fat loss was this easy... Though cutting back on your calories could seem like a piece of cake, in real life your sweets cravings are more likely to keep you pining for sugar treat day and night. No more sugar binges! Skinny Piggies are yummy gummy fiber supplements that naturally help suppress your appetite, meaning that your cravings will be soothed without you cheating on your diet. Hunger is for the most part controlled in 2 ways: energy intake and the stretch in the stomach. After you eat food, your stomach fills up and the food stretches it. That is what makes you feel satisfied and you don't feel hungry and stop eating. Ok, so what now? Have a dessert first! Chew a Skinny Piggy approximately 20-30 minutes prior to your meal with a full glass of water. When the gummy gets to the stomach it will soak up the water and expands into a gentle gel. This gel then uses up space and tells your nervous system that you just ingested a good portion of food -all prior you have eaten real food. 30 minutes later and you are all set to feast upon your desired meal! At that point, the gel is being slowly digested and you feel kind of full and that may help you eat a smaller portion and still find yourself feeling full and satisfied. Have one Skinny Piggy gummy and you will eat less, stop sugar cravings and allow your body to burn fat for longer while feeling satisfied. That means you can stop desire to eat and food cravings, hunger, and eat much less, all without feeling like you're on diet. When you use these delightful gummy fiber supplements prior to you eat dinner or lunch, they will form a gel coating all around the food. That reduces the transport of the carbohydrates into the blood. That helps keep the blood sugar a bit more normalized and makes certain your body remains in fat burning mode all day long. It may also help make your workout sessions much easier. There's no end to the number of fat loss pills sold on the market today. From fat-loss pills to hunger suppressants, it's difficult to find out what fat-loss supplement is right for you. Going through the research on each product is a difficult task, but Skinny Piggies are unique for the following reasons. Skinny Piggies contain zero artificial additives: in fact, you can actually read and pronounce each of the main ingredients. The nutrient rich, 100% natural ingredients in Skinny Piggies also have added benefits for example support for anti-aging benefits, healthy looking nails, and healthy looking skin. Skinny Piggies have no stimulants and zero harsh chemicals. No stimulants means no running out of steam and no restrictions on when you can use them. Day or Night. No harsh chemicals means Skinny Piggies are gentle on your stomach. 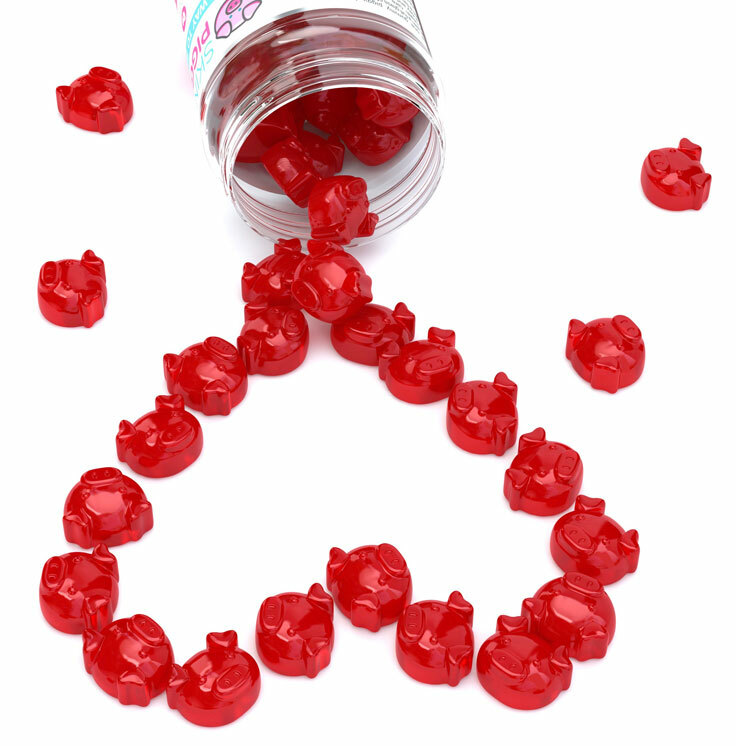 Finally, what other diet pill is as delicious as a mouthwatering strawberry flavored gummy? 'Thought so! You will really love snacking on these so forgetting to take your diet supplement will definitely no longer be an issue. They are tasty and anyone can begin right off the bat. Try one and they will certainly become a highlight of your day.